We took a field trip to Flora Grubb Gardens… WOW! It was beautiful, amazing, and everything I'd hoped for. A huge selection of outdoor plants and inspiration everywhere you look… plants in old sinks, a wall of colorful hanging tables and chairs, woolly pockets (wool planters! )… the list is endless. You should really check it out. Just got word that their pumpkin truck has arrived! photos: Kevin built this vertical tillandsia garden (FG calls them thigmotropes). And I will definitely try to recreate this at home! I think it'd look perfect on the wall behind the tv. 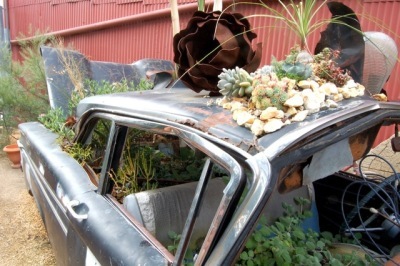 So glad they found a use for this sweet old rusted out car. There are plants in every crevice… so much fun! This side faces the street… would you believe it's about 40' to the top! It's so stunning.